The 3rd APEC Future Scientist Conference – AFSC was held from 11th to 15th April 2011 by APEC Mentoring Center for the Gifted in Science-AMGS and National Taiwan University – NTU. During the opening ceremony, the students had the chance to receive congratulations and speeches from the representative of the Organization, Prof. Sang Chun Lee, president of AMGS, and Prof. Chao-Ming FU, the professor in Physics Faculty of NTU. The presentation “Dance with the typhoon” was presented by Prof. Chun-chieh Wu, one of the first men in the world to enter the hurricane eye for the sake of science when he was a post-graduate at MIT, and today he is a leading expert in the weather forecast field. Right after the ceremony was the Poster Presentation Competition. Each team presented a poster prepared before about a science study and the presentations were marked by the members of the committee. On the second day, the delegations visited Tzu-Chi (Eco) Foundation, a humanitarian and environmental organization founded by Dharma Master Cheng Yen in Taiwan. Nowadays the organization comprises about 320 offices scattering in 47 countries globally. The students seized the chance to visit recycling and producing- environmental-friendly-product establishments. They also enjoyed the delicious vegetarian meal there! After that, the delegations continued to visit the Chiang Kai-shek Museum in capital Taipei. It was not only a magnificent museum with a large number of photos and documentaries about an important character in both Taiwanese and Chinese history, but it was also a center of nature and environmental protection these days. At that night, all students had to complete the team project in designated groups (each group consisted of people from different countries). Having been provided with necessary materials, each team would use their knowledgw to build an eco-friendly house. Because of the time limit, every team tirelessly worked until late night, some even worked until 3am. On the morning of the third day, each team had to present their projects with ideas of using solar energy, wind energy, water energy and many different kinds of biological energy. The standards for evaluation were creativity, possibility, economical efficiency, and presenting skill. In the afternoon, the surprising and exciting award-announcing ceremony took place. 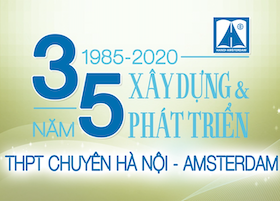 In the team-project part, the students of Hanoi-Amsterdam received 3 gold medals, 3 silver medals and a bronze medals – the highest achievement a delegation could attain. Next, the colorful cultural night was held. Each delegation took turns to present their countries and their people by songs, dances or presentations. Our delegation performed the song Trong Com, and Mrs Nguyen Phuong Lan, the lead teacher of Vietnam Delegation, performed the “Cay Da Quan Doc” dance. The international students were deeply impressed by our performances, our traditional beauty, and our talent. Having worked under a lot of pressure, most delegates spent their freetime during the night. On the 3rd night, our students went to the night market together and came back at 2 am. Those were very special experiences of people’s daily life in Taiwan, not only of the professors and scientists in many centers. The students left Taipei for Taichung city to visit the National Museum of Natural Science in the last day. They all had the opportunity to talk to Mr. Wei-Hsin Sun, president of the Museum, and he was also a professor of Physics Faculty in NTU. He sincerely shared his opinion about science, as well as the must-have qualities of a modern scientist. Besides the genuine enthusiasm for science, open attitude to new ideas from other cultures should also be taken into account. On 15th April afternoon, Vietnam delegation, which was one of the last delegations, left Taiwan to come back home. The conference ended in both happiness and regrets. Lessons and inspirations attained from the successful scientists, along with cultural presents, represented the friendship between many countries, which were unforgettable memories. Wishing great success for the 4th AFSC in Indonesia in 2012!